Stereo asks for code sporadically, will not turn on or will turn on then powers off? This problem was troubleshot to poor connections on the ceramic fuses in the fuse box under the hood. Access the fuses, twist each fuse in it's holder. 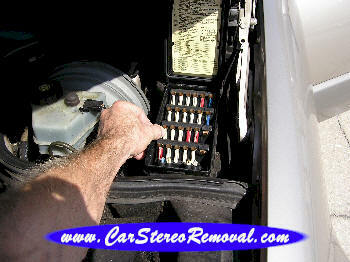 This will clean the contacts at both ends of the fuse and may bring the stereo back to a more reliable working condition. Your donations are appreciated and will expedite the posting of many more DIY repair guides. Thank you.